I made another little trip to Arrowhead Alpines (I know I said I'd TRY not to go again... but somehow...) and among other things, I got this little trio of plants that is making my garden look a little like Danger Garden. In more detail, I got this adorable (and vicious) Opuntia fagilis. 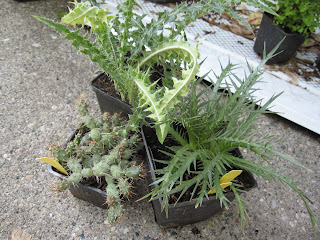 I'd picked it up because it was so cute, then asked about the hardiness -- they told me it is a form from the most northernly known cactus population in Canada, and will laugh at mere Michigan cold. 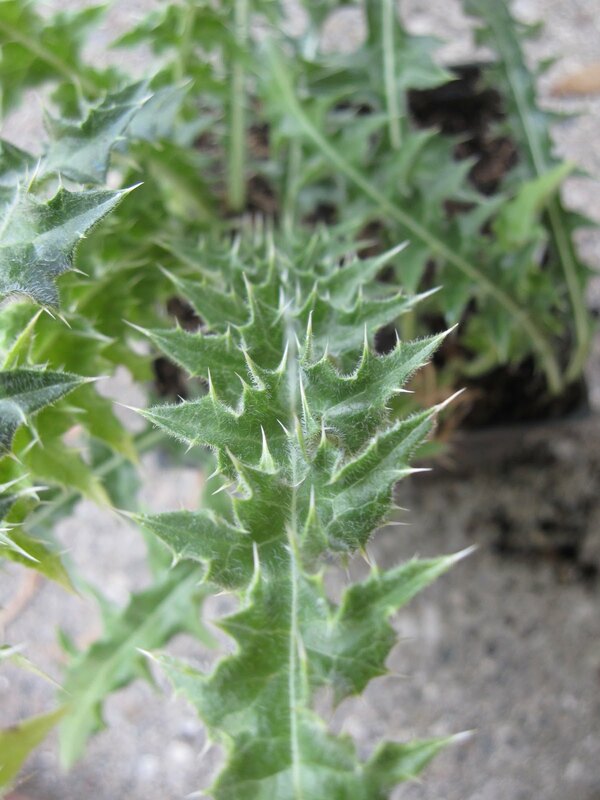 This evil beauty is Acanthus syricus. Yes, acanthus! It has flowers just like your typical bears breeches (as you can see here) but the foliage is kicked up a notch. 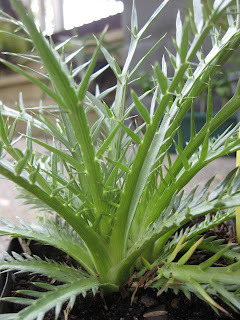 And finally, this Eryngium venustum. This may not look quite as bad as the other two, but it is by far the most dangerous of the group -- the leaves are razor sharp. But I love its incredible, geometric lattice work of spines. I had one a couple years ago, which didn't make it through the winter, so this one is going in a sheltered spot near the foundation -- hopefully it will survive for me. All of which makes me wonder, why do I like these plants so much? My mother-in-law (who, by the way, is awesome -- no mother-in-law jokes apply) always laughs at me about my "thistles." For me, I think, it is about visual contrast -- the soft, rounded forms of most plants look all the better for being sprinkled with a few daggers. At least I think so. What do you think about dangerous plants? Very nice selection. I tend to hurt myself often with plants like these. That being said I loved them! I just received a bunch of palms seeds. They'll all either have sharp thorns or fronds. It's a recipe for disaster/joy. I was admiring the photo and thinking what lovely selections you had made long before I saw the link to my blog! I think you are right, the spiky contrasts and complements the usual round softness of foliage. I think that's part of why I am so in love with Verbascum right now. The contrast of the so soft with the spiky. I look forward to reading what the other commenter's have to say. 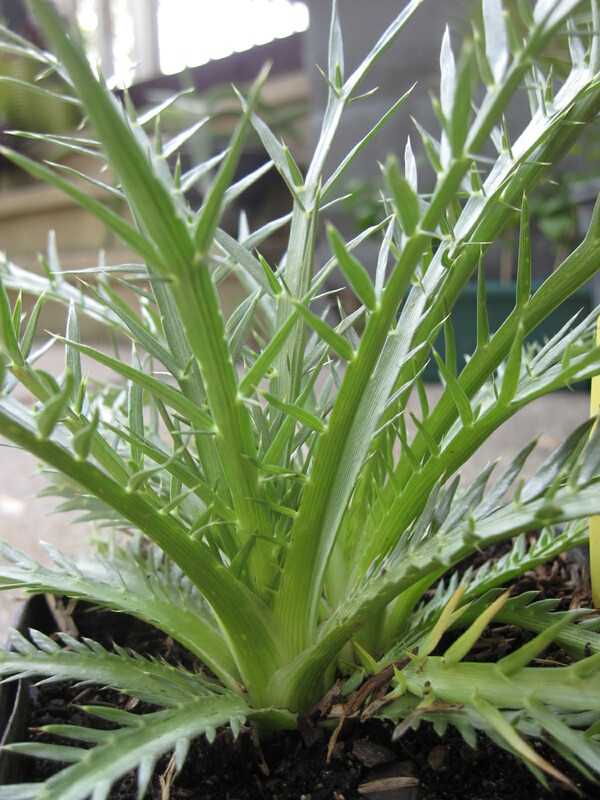 I like the sharp ones too (Pandanus, Pachypodium, Euphorbia, Agave, Neoregelia, Aloe, Araucaria bidwillii, etc. ), though I do like them to be honest about it. Asparagus and Opuntia, for example, are on my bad side because they lie about being fluffy and soft. (Or at least there's one Opuntia that does. Some of them are more straightforward.) I'm not sure where this comes from, though it can't hurt that some of these are plants I find very easy to grow. They look like plants you would see in the desert of Arizona, not Michigan. What a nice contrast they will be. 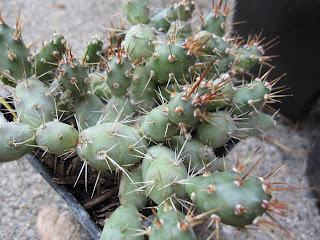 I try to avoid dangerous looking plants, though I do have some passalong Opuntia in my garden. They can "bite", and it hurts!